Apple has finally unveiled its new flagships iPhone 8 and iPhone 8 Plus in an official event in the Steve Jobs Theater. The new iPhones comes with upgraded internals and the new iOS 11 OS out of the box. The company not only launched the new iPhone sucessors at the event but also launched the new iPhone X smartphone as well that comes with a different design and exciting features. We will talk about it later, but let's now check the features of the new iPhone 8 and iPhone 8 Plus. The iPhone 8 is priced at $699 for the 64GB internal storage variant whereas the high-end variant with 256GB internal storage is priced at $849. The iPhone 8 Plus is priced at $799 for the 64GB variant and $949 for the 256GB variant. Both the iPhones comes with Gold, Silver and Space Gray color options. The pre-orders will start from September 15th in different countries whereas the sales of the device will go on starting September 22. The iPhone 8 features a same 4.7-inch IPS 326 ppi display with 1334 x 750 pixels resolution, 1400:1 contrast ratio, 625 cd/m2 max brightness and 3D Touch. it is powered by a Six-core A11 Bionic 64-bit processor with three-core GPU and M11 motion co-processor. It comes with 64GB and 256GB internal storage options however, the RAM of the device is currently unknown. It comes with iOS 11 pre-installed. The new iPhone 8 comes with IP67 ratings making it water and dust resistant. It features a single 12-megapixel rear camera with f/1.8 aperture, OIS, Six‑element lens Quad-LED True Tone flash, 4K video recording at 60 fps, Slo‑mo 1080p at 240 fps and we have a 7-megapixel front camera with f/2.2 aperture, 1080p video recording and Retina Flash. The device comes with a built-in rechargeable lithium-ion battery with Qi wireless charging, fast charging and delivers up to 12 hours internet use and up to 14 hours of talk time. We have a TouchID fingerprint sensor available and the device also comes with stereo speakers. Connectivity options available are 4G VoLTE, WiFi 802.11 ac with MIMO, Bluetooth 5.0, NFC with reader mode, GPS with GLONASS. It measures 138.4x 67.3×7.3 mm and weights 148 grams. 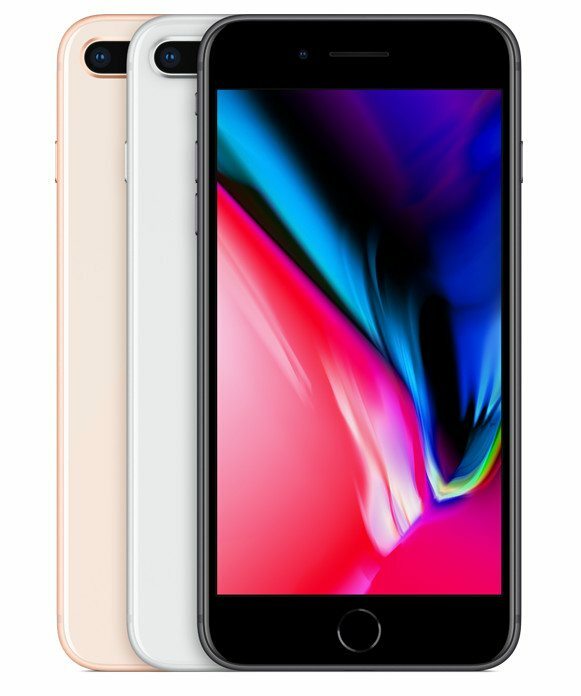 The bigger iPhone 8 Plus features a 5.5-inch IPS full-HD 401ppi display with 1920 x 1080 pixels resolution, 1300:1 contrast ratio, 625 cd/m2 max brightness an 3D Touch technology. It is powered by a Six-core A11 Bionic 64-bit processor with three-core GPU and an M11 motion co-processor. It also comes with 64GB and 256GB internal storage options and it runs on the iOS 11 out of the box. It comes with dual rear camera with a 12-megapixel wide-angle camera with f/1.8 aperture and another 12-megapixel secondary telephoto camera with f/2.8 aperture with OIS, 2x Optical zoom, up to 10x digital zoom, Six‑element lens, Quad-LED True Tone flash, 4K video recording at 60 fps, Slo‑mo 1080p at 240 fps.